This week on TCM is a literary junkie’s dream. Novel adaptation after novel adaptation all week long. You absolutely MUST set your DVRs for all this goodness. BUT – I’m not going to feature one of them for this post. I’ll list them all at the bottom (as well as some other great recommendations). Instead I’m going to feature one of my favorite comedies: Ninotchka. It’s 1939, and post-revolution Russia is hard-up for cash. Three Russian emissaries fly to Paris, France to try and sell off some jewelry – but not just any jewelry. These are the crown jewels of the former royal Russian personages, some recently “liquidated” from power, others in exile around Europe. One of those exiles is the Grand Duchess Swana (Ina Claire) who is now living in Paris. When she discovers that some of the jewelry are pieces she left behind in Russia, she sends her lawyer/boyfriend Count Leon (Melvin Douglas) to distract the emissaries with all of Capitalism’s luxuries so she can begin legal proceedings to reclaim the jewelry. Leon does such a good job at “corrupting” the silly Russian troupe that a supervisor is sent from Russia to get them back in line and back on track to selling the jewels before Swana can complete her legal petition. The supervisor is Nina Ivanova Yakushova (Greta Garbo), a no-nonsense Comrade who is appalled at the decadence of the West. She starts whipping the emissaries back into shape, much to Leon’s chagrin. Once he sees the supervisor is the young, beautiful Nina, he sees an opportunity to distract the new Russian while he keeps protecting Swana’s interests. 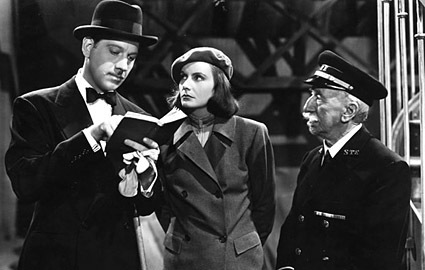 Of course, it’s not long before Leon sees Nina as his Ninotchka. But how will Ninotchka feel when she finds out he’s only been paying attention to her to protect Swana? Okay, so the plot is a little convoluted. But it’s not really about the story. The comedic genius of Ernst Lubitsch is what drives the movie, and even when it starts to drag a little at the end, you’re still laughing, so you don’t care. Melvin Douglas isn’t my favorite choice as a leading man, but he’s perfect opposite Greta Garbo. And Garbo is great. Her deadpan delivery is perfectly aloof and just the contrast needed against Douglas’s lackadaisical demeanor. The supporting cast is also spectacular, a regular cast of also-rans that are expert comedians. It’s also a fun time capsule. Released before America was involved in WWII, both France and Russia were considered allies. So while there are definitely political undertones to the movie (White Russia vs. Red Russia, and the role of European countries like France within that conflict) the movie presents various aspects of that condition without taking sides. Almost to a fault, in my opinion. But it’s still great to watch. Something I appreciate: no fake accents. It’s a movie about Russians and Frenchmen in France, but no one fakes an accent. Douglas and Claire sound 100% American, and the other actors all maintain their original accents. It is much more comfortable than the often-distracting attempts at faking an accent. 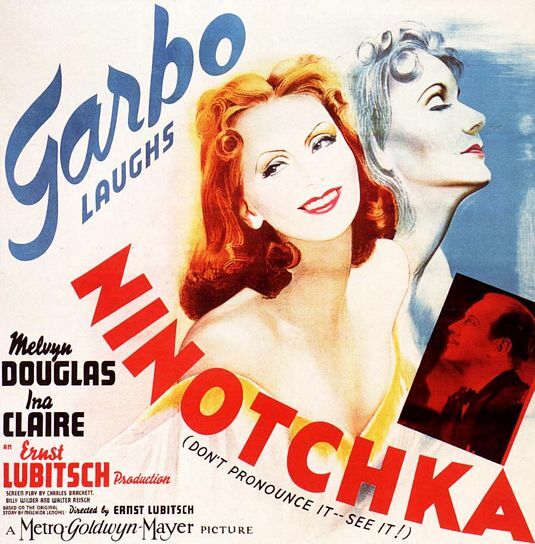 Ninotchka will be on TCM on Thursday, November 29 at 12:30 AM CST.